Cellules souches embryonnaires / Embryonic stem cells. Stem cells and regenerative medicine, principles, prospects and problems. Germ cells: the eternal link between generations. Embryonic stem cells as a cellular model for neuroectodermal commitment and skin formation. 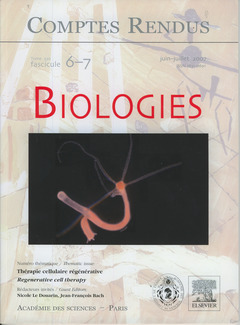 Régénération animale et cellules souches / Stem cells and animal regeneration. Positional identity of adult stem cells in salamander limb regeneration. RNAi gene silencing affects cell and developmental plasticity in regenerating hydra. Stem cells and the Planarian Schmidtea mediterranea. Cellules souches spécifiques des tissus / Tissue-specific stem cells. Emergence of haematopoietic stem cells during development. Neuronal replacement in microcircuits of the adult olfactory system. Neural crest progenitors and stem cells. Skeletal muscle progenitor cells and the role of Pax genes. Pancreas phylogeny and ontogeny in relation to a pancreatic stem cell'. Thérapie cellulaire / Cell therapy. La thérapie cellulaire des maladies héréditaires du système hématopoïétique. Bone-marrow mononuclear cell therapy of severe ischemic heart failure. La thérapie cellulaire en cardiologie. Repair of spinal cord injury by transplantation of olfactory ensheathing cells. Regulation of epithelial stem cells in tooth regeneration.